Yeah, that’s right…… we’re getting ready for demolition! 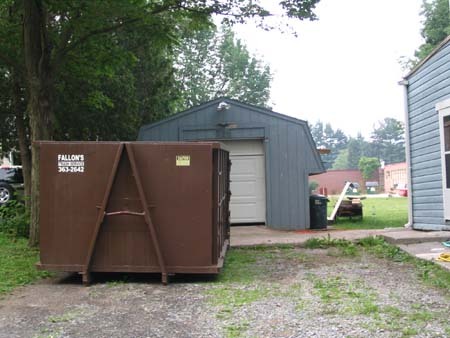 We love us some dumpster action; we’ve rented the big one 4 times in the past two years. It’s a lovely driveway decoration, don’t you think? Could be closer to the side of the house though… we may have them reposition it before this weekend. 1) never pry with a crow bar or even cats paw with your back to the edge of the roof – if it comes up suddenly, you could lose your balance and fall back. Or off. 2) Similarly, no matter how tempting to get close to said prying-thingy, make sure you’re holding it at arm’s length. I have a scar on my cheekbone from this lesson. 3) Rigging a block and tackle and a bucket to the top of the ladder makes life easier when you’re working alone. 4) Even though i’m a girl and the guys are (usually) stronger and everything, this was totally a job i could do. It just takes patience. 5) Bring a radio, cordless phone, end expect to get tar on everything when it comes time to seal the sucker. As in clothes and shoes you never want to wear again. Gloves wouldn’t be a bad idea, either. Hey guys–congrats on the roof-thingy. It is a great feeling to have a roof (that doesn’t leak) over your head. It might be too late,but on our Italianate (flat top) our architect suggested a product called Universal Protective Coating–which is a four part system of elastomric polyurethane. We put this on 5 years ago and it still looks in good shape and provides a nice deck to walk on…Maintainence requires a top coat about every ten years (which is like rolling paint). It seems to be a nice product…glad we used it rather than a torch-down. Good luck in with your roof project…May dry days be with through the project!